Saturday April 16 1910 I did some baking and the other wash. Will went to town at 12.12. I washed all afternoon painting screens and cleaning the garret floor. It snowed all the afternoon. Ott or Fannie to Chicago tonight Sunday April 17 1910 It was a cold dark day. I did the wash and devoted all my spare time to letter writing. I wrote Henry Hart. Sallie Reed Cousin Jen. Lydia to whom I will send pictures of both Will and I and a letter to Alice Condon. I have not lost any of my chickens Monday April 18 1910 I did the wash and finished getting my mail ready It was snowy and bad. I made tatting in the afternoon. Trishie & Charlie came out for 3 hens and eggs to [ret.?] 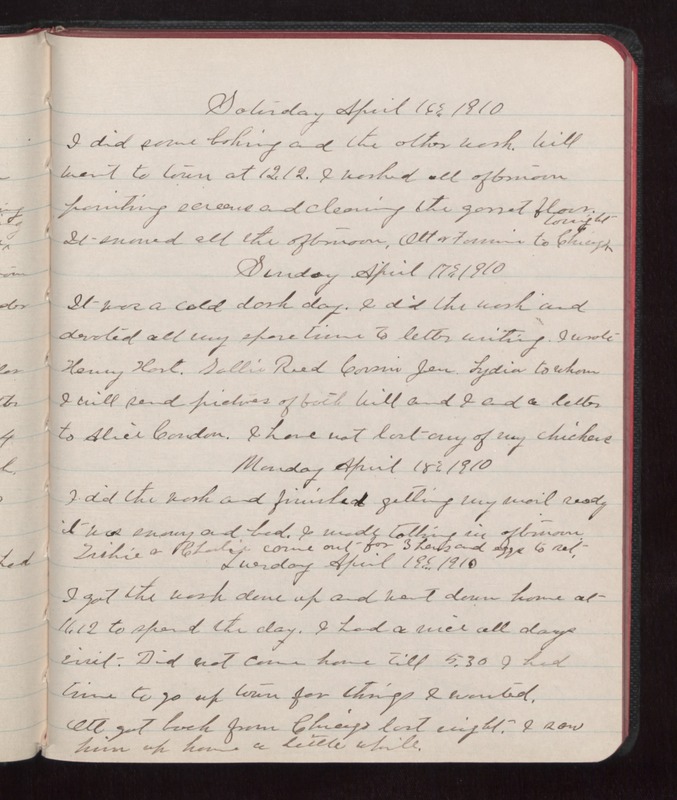 Tuesday April 19 1910 I got the wash done up and went down home at 11.12 to spend the day. I had a nice all days visit. Did not come home till 5.30 I had time to go up town for things I wanted. Ott got back from Chicago last night. I saw him up home a little while.